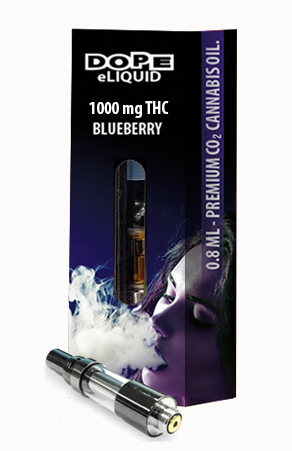 DOPE Blueberry THC e-Liquid is made using premium Supercritical Co2 extraction. This ensures your DOPE THC e-Liquid is of the highest quality available in Canada. This THC e-Liquid is Dope! 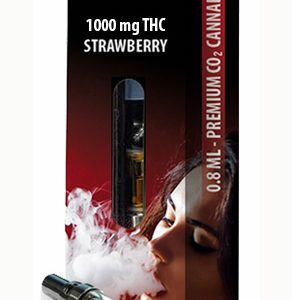 DOPE Blueberry THC e-Liquid is made using premium Supercritical Co2 extraction. This ensures your DOPE Blueberry THC e-Liquid is of the highest quality available in Canada. If you do not have a vaporizer battery with a 510 screw thread, consider the DOPE Blueberry THC Starter Kit which includes a THC e-Liquid cartridge, battery with a 510 screw thread, and a USB battery charger. This kit has everything you need to start enjoying this DOPE e-Liquid. I was so excited when my package was delivered. It’s no wonder these are out of stock. I was ready to purchase more, guess the word got out how sinfully delicious this stuff is! – Patiently waiting for more now!! I’ve tried numerous flavoured thc pens, and have found that the lot of them have an awkward sweet flavour/aftertaste with them. This however does not! Blueberries the most delicious flavour I’ve tried thus far. Cannot wait to try more of the flavours! Superb tasting oil accompanied by a wicked buzz! Frickon amazing. Really. Im obsessed! Absolutely delicious flavour accompanied by a stellar high! 6 thumbs way up! Obsessed, the best blueberry flavouring I have ever tasted!!! Just a couple of tokes and I was chillin. Fantastic flavour too! 17 stars way up there! Produces a great high after 2 tokes. The flavour is awesome to boot! This is my new favourite. Flavour and high are second to none! Outstanding all around tasty high! I love getting blueberry baked with this awesome e-Liquid!